After the release of Innuendo in 1991, Freddie knew that he would not survive to make another Queen album. So, he got the band to write anything, and he would sing it. He wanted to give all he could before he died, and instructed Brian, Roger, and John to complete the songs later, putting them together as Queen’s final studio album. He died later that year, and Irena Sedleckas made a sculpture of Freddie, which stands in Montreux, which is the sculpture on the cover. Years before Freddie started recording solo material, he created a sound clip of himself messing around on the piano at Musicland Studios in Munich, 1980. It was later, for the use of this album, that “It’s a Beautiful Day” was extended 2 minutes and 32 seconds. The more classical section, without Freddie’s improvisation, was put together by John. In the Netherlands, the song “It’s a Beautiful Day” was used in a TV commercial for Lenie ‘t Hart’s seal shelter. The shelter didn’t have a budget for advertising at all, so the commercial had to be free of cost. Queen manager, Jim Beach, liked the idea, but wanted to see the completed commercial first, and was later delighted to give consent for a free use of “It’s a Beautiful Day”. For as far as known, that was the only time a Queen song was made available at no cost. May sang the last verse, since Mercury could do no more. 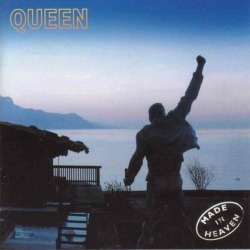 "Heaven for Everyone" was a track Roger Taylor wrote and tried out with Queen in 1986, although according to some sources it was written with Joan Armatrading in mind to sing it. Whether she turned it down or Taylor withdrew his song is unclear, but it was recorded for his other band The Cross. One night Mercury came to visit The Cross at the studio and after some drinks he gave them ideas of how to sing the song and ended up recording the lead vocals for it.